SKU: HOM. Category: Tile and Grout Cleaners. PLEASE NOTE: Only 2 bottles maximum per order. The safest tile & grout cleaner for any surface. To be used daily, weekly or monthly. No streak marks, no residue, no need to rinse; keeps floors cleaner for longer. Perfect for maintaining colour sealed grout. Comes in a concentrated formula dilute 25 mls to 5 litres of water. 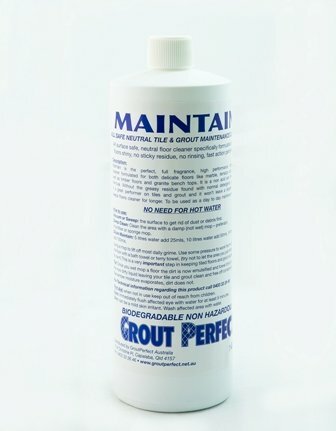 This product should be used after using restore tile and grout cleaner or after colour sealing as a day to day cleaner. Neutral pH balance and fragrance. You can use it for all surfaces, wood, leather lounge suites, granite and marble bench tops safely. Cleans polished porcelain tiles or any shiny surface material without losing that shine. No more streaking or haze. Just add more bottles in your checkout order if required.